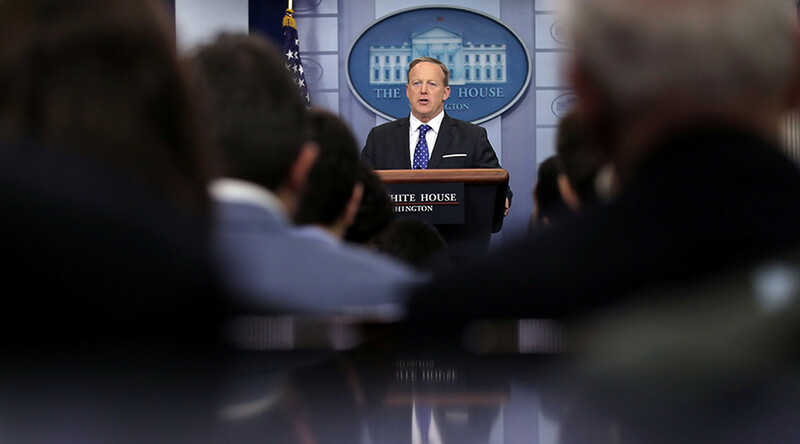 White House press secretary Sean Spicer blocked CNN, the New York Times, the Los Angeles Times, Politico and other news outlets from a gaggle. Several organizations boycotted the gathering, which was originally set to be a briefing, in response. Spicer required that journalists sign up for an “expanded pool gaggle” on Friday, retaining the right to exclude reporters. He had already berated a smaller pool gathering in the morning, the New York Times’ Glenn Thrush reported. The White House also canceled the previously scheduled daily briefing in favor of the gaggle. While several outlets that President Donald Trump has previously deemed “failing” and “fake news” were excluded, conservative organizations like Breitbart, the Washington Times and One America News Network (OANN) were allowed in. The Associated Press and Time boycotted the afternoon gaggle as a result, and the White House Correspondents Association is protesting, according to CNN’s Jim Sciutto. Along with CNN, the New York Times, the LA Times and Politico, Spicer also excluded The Hill, BuzzFeed, the Daily Mail, the BBC and the New York Daily News. Several major news organizations were let in to cover the gaggle, including ABC, CBS, NBC, Fox, Reuters, Bloomberg and McClatchy. The White House decision drew strong condemnation from journalists on Twitter. To be clear: this is how anti-democratic authoritarian regimes behave. CNN called their exclusion “an unacceptable development” in a statement. Despite the decision, the Trump White House “is more accessible than probably any prior administration,” Spicer told the reporters who were allowed in, according to Thrush. For the first time, there are “Skype seats” for journalists who cannot physically attend briefings. Spicer during gaggle: "We have shown an abundance of accessibility and we have brought more reporters into the process"
Trump supporters applauded Spicer’s move on Twitter. A press “gaggle” is an off-camera meeting, in this case in Spicer’s office, rather than the daily on-camera briefing that takes place in the James S. Brady Press Briefing Room. The daily “in-house” pool contains 21 reporters who cover White House events when there is not enough room for the full press cadre. There is also a smaller pool of reporters that travels with the president. However, several of the excluded organizations are normally in one or both of those pools. When reporters asked for an explanation as to why they were barred and who was allowed in, White House spokeswoman Stephanie Grisham accused one of “threatening” her because the journalist had said news outlets would be filing stories about the issue, according to the excluded New York Daily News. Senior White House reporters have said they’ve never seen another presidential administration make such a move, but Trump was known for banning outlets, including the Washington Post, from his events on the campaign trail. -@nytimes exec. editor: “Nothing like this has ever happened…in our long history of covering multiple administrations of different parties." The reporters who were allowed in have split up the transcribing duties to share with colleagues who were left out, the Wall Street Journal’s Byron Tau tweeted. Numerous White House reporters have split up the duties of transcribing the Spicer gaggle to share with their colleagues who were excluded. “The pool was there, so various media mediums were represented,” she said.